I decided to take a stab at digital painting. It was a fun process, and I will definitely do another one. Ultimately, my goal is to have a more stylized look, like Janice Sung’s digital illustrations. I think I will try doing this in Procreate next time. For my first time, not too bad right? Here’s my process, in case anyone is wondering. 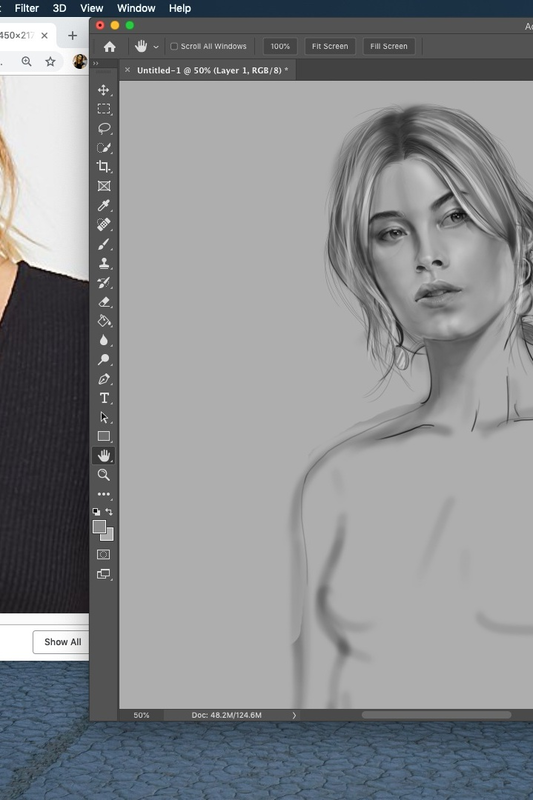 Found reference images for body & face and made that my first layer, lowering the opacity so I can draw on top of it and lock it down. Create layers for rough sketch, sketch, values, skin, outfit, and hair. I start out rough sketching the outfit and body on a low opacity soft brush. I build on top of that layer in the sketch layer, with a more refined brush, darker opacity, and try to really draw out the details. I keep the images up in Preview in another window, almost as if I was drawing a still life. 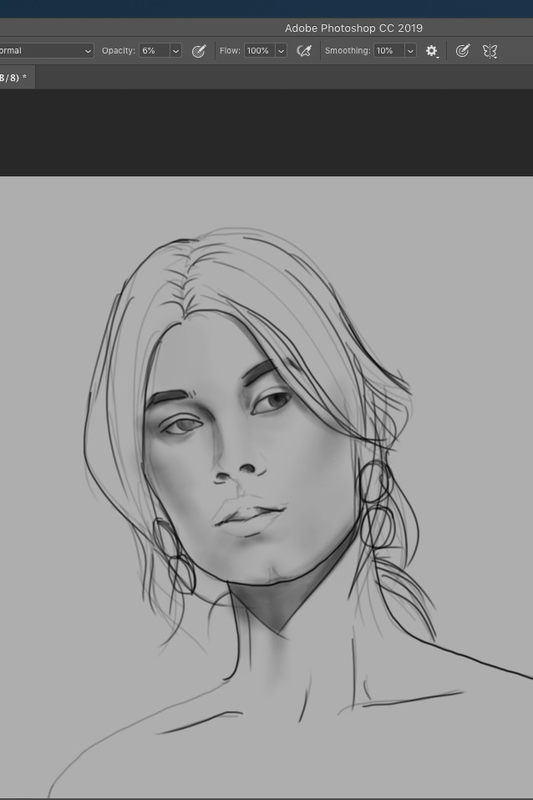 I start with the values, before going into skin, using a soft brush, low opacity again. It’s easier to build up, and have everything blend better. Once values are down, I move into skin tone. Again, soft brush, low opacity, and I stick primarily with reds/orange/and some blues for back-lit areas. Orange, was used primarily under the neck and by her hair, to create the illusion that there was warm light source. Same process goes for hair, but I gradually refine my brush smaller & smaller to make those loose strands of hair poke out from the edges. The outfit was fairly easy to do. After I had all my values down for the blouse, I created a selection of the silhouette of the blouse and filled it with a pattern and placed on soft light (it makes it look like a lacey texture or a burnout fabric). For the jeans, I actually skipped the sketch part and moved directly into making a selection of the silhouette and filling it with a pattern. I make sure the pattern swatch has no obvious seamlines, before I fill it in my selection. I rasterize the fill, use dodge and burn to create the folds, wrinkles and seamlines and voila! The shoes and the purse, I did not draw. I was too lazy to worry about that.